We love the story of Rich and Tina Wagner. As you will read below, Rich reached out to Team Gleason to ask if we could give his wife a weekend getaway for all the help she gives him daily as his caregiver. However – when we offered her the trip, Tina said she would rather spend the time away with Rich. With the money raised for The Gleason Initiative Foundation, we were able to send Rich and Tina on a relaxing weekend getaway. See below for letters from Tina and Rich. I am writing to you and all of Team Gleason to thank you for the wonderful weekend getaway you gave to myself and my husband, Rich. As you know, it is my husband who is currently suffering from the debilitating effects of ALS, not me, but the weekend was for me!!! Crazy… As my husband sits on the couch daily watching me care for our home, our two small children, and himself, instead of him seeking out some sort of adventure or trip for himself, he contacted Team Gleason to see if they could help give me a break and send me away for a weekend. I was unbelievably touched by his kind concern for me, not himself!! I am a very lucky lady. As anyone in my shoes could use a weekend off, I said yes, yes, yes, but insisted that any weekend would have to be with Rich. Team Gleason was happy to accommodate, and so we were off. We live in Long Island, NY. We decided on a weekend spent 1 day in Mohegan Sun, in Ct., and our second night in Greenport, NY, on the easternmost tip of the north fork of Long Island. It was wonderful.!! I had a massage, we played some slot machines, had a delicious dinner and then saw Jefferson Starship in their Wolf Den. The next day, we took a ferry across Long Island Sound to Greenport, where again we had a delicious dinner, then did some window shopping and lunch the following day before leaving. It was a perfect getaway from the daily grind of life as we know it, for both of us. I could not have been happier!! We love our children more than life, but to be able to have this great break knowing they were in loving hands, it was the best!!! 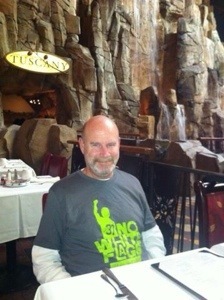 So, thank you again and again to Lauren, Steve, and all at Team Gleason for making this happen. Thank you for helping me to keep my sanity during this surreal journey I take with my children, our families, and my wonderful husband, Rich Wagner. The getaway was really nice! 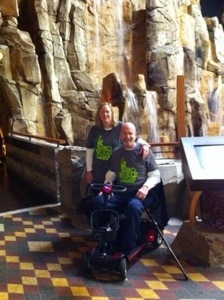 We left Friday morning and drove up to Mohegan Sun in Connecticut- it took about 2 1/2 hours. Tina had a spa appointment to get to almost immediately when we arrived. Apparently, they are booked solid on weekends for spa appointments because there weren’t any open times later in afternoon or on Saturday morning. So I went to the room while Tina had a massage. After she got back we went downstairs for some gambling and dinner. We are not big gamblers so we tried some video poker machines. Within 5 minutes I scored 4 of a kind and cashed out for about $100! We puttered around for a little while after that because we had an early dinner reservation. We went to Bollo, an Italian restaurant and had a wonderful meal. After dinner there was a free concert featuring Jefferson Starship. They were very good and played all the songs you’d expect to hear from them including “white rabbit”, “somebody to love”, “miracles” and “count on me”( our wedding song!). The next day we left because Lady Antebellum was playing and the hotel rates doubled. So we took a ferry across Long Island Sound to Orient Point and drove to a town called Greenport, NY.